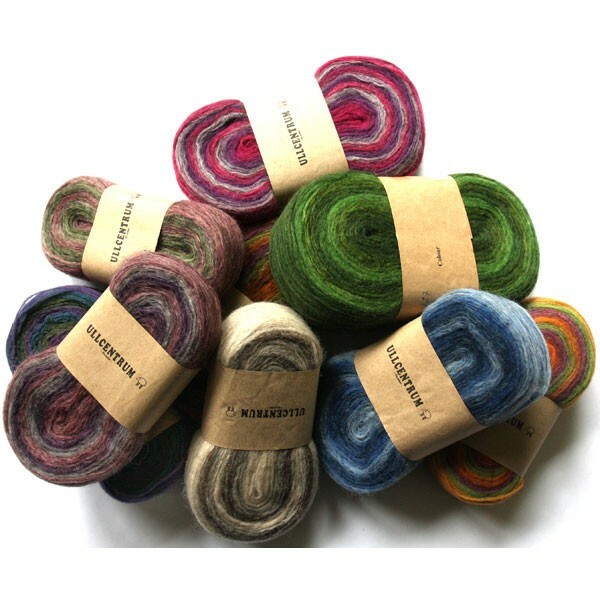 We were immediately smitten by Swedish Gradient Dyed Ull and its brilliant colors. The colors below are in a thin strand. We also sell colors in a thick strand. It is put up in the same manner (wheels) as our solid-color Unspun Icelandic wool. The 100% wool (from 'local' Swedish sheep) is washed in an eco-friendly manner, and still retains a bit of lanolin. The dyeing process is UllCentrum's own secret recipe. The wool is put up in varying weights, so we have classified the wool into Small (at least 2.5 oz. ), Medium (at least 3.5 oz) or Large (at least 5.5 oz.) wheels. Material: 100% Wool Weight: Varies, Available in Small (at least 2.5 oz. ), Medium (at least 3.5 oz. ), and Large (at least 5.5 oz.) Yardage: Varies based on size; a medium wheel should allow you to knit at least two caps. Approx. Gauge: 5 sts to the inch. Limited Quantities. Choose the quantity for each color you wish to order and click Add to Cart at the bottom of the page.